Hello, I’m Nalikolehua; I’m Japanese, and Nalikolehua is my Hawaiian name (if you’d like to know how I was given a Hawaiian name, you can find the answer here). I’ve been living in Mumbai, India, since 2010. Before that, I was living in the Tokyo metropolitan region since I was born. Oracle cards were on the shelf of a massage shop in Tokyo, where I used to take Lomi Lomi the Hawaiian spiritual massage, and I enjoyed pulling the cards just for fun. 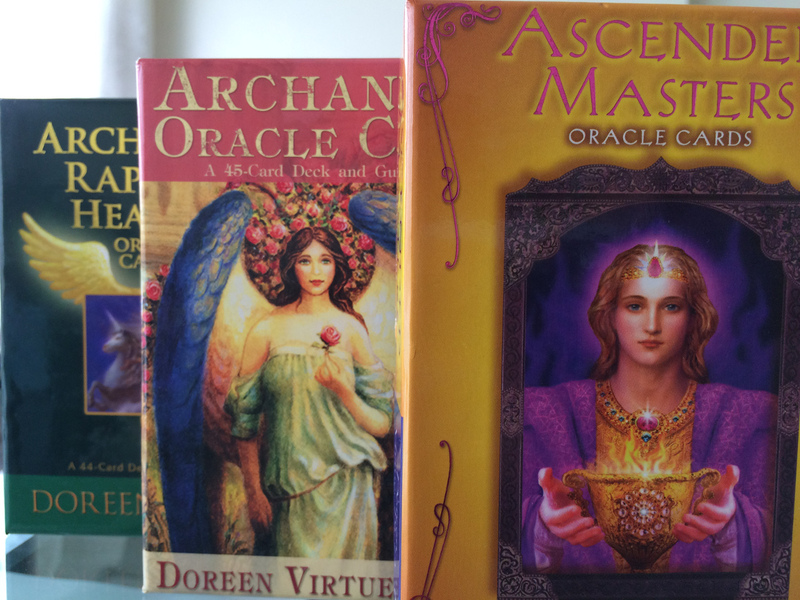 I happened to find and bought the Ascended Masters Oracle Cards, which was the first deck of mine, from a stall selling only gems and angel cards that is situated in a big shopping mall in Mumbai. Since then, I enjoy angels’ message by picking up a card or two almost every day. I find angel cards at general bookstores in Mumbai, unlike in Tokyo. Even in a new book section, I find books on spirituality displayed next to mystery novels, just like other books. I mean, talking about spirituality isn’t unusual here. These facts broke through the barricade that had stopped me from pursuing my interest in spirituality (this may sound strange to Indian people, but it would have been impossible for me to do the same if I were in Japan because of its cultural bias against spirituality). To my surprise, although a single angel card deck mostly consists of 44 cards, I drew a few particular cards repeatedly within a month or two and noticed that these cards had continued to appear until I got the message. 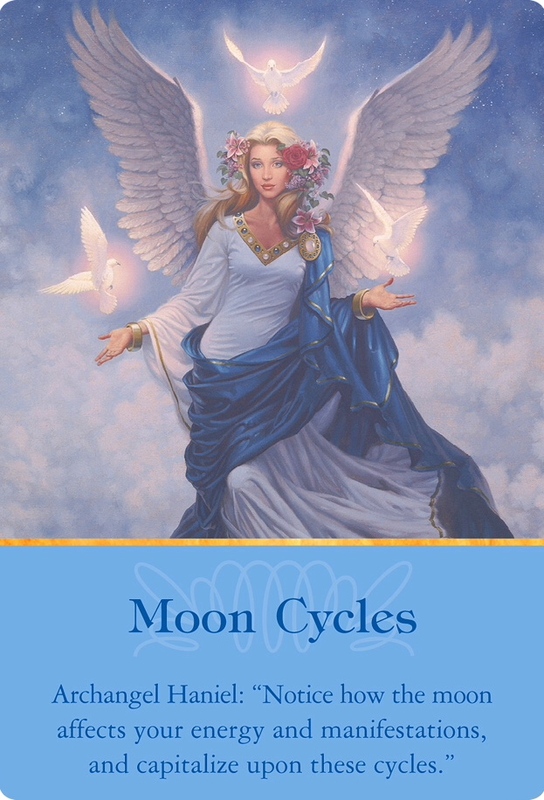 Notice how the moon affects your energy and manifestations, and capitalize upon these cycles. … As you discover the moon’s connection with your vitality and moods, you’ll be more in touch with its Divine magic. I used to pay attention to the moon cycles, using a diary with the lunar calendar, and also ever since I read Moon Time: The Art of Harmony with Nature and Lunar Cycles, I’ve been interested in Moon Signs as well as Sun Signs. But, back then, I was oblivious of the moon cycles because of my new career in India. Following the suggestions from the Moon Cycles card, I purchased the Moon Worx app, which provides the lunar age and Moon Signs, and installed it in my phone. I then found that my mood was synchronized to the phases of the moon; my mood lifts when the moon waxes and goes down when the moon wanes; this made me realize the message from the Archangel Haniel: There’s no need to feel bad about myself for having ups and downs; I had blamed myself for that. After I became aware of this synchronization, I stopped developing self-resentment and dealing with my emotions has become much easier. Interestingly, I haven’t picked up the Moon Cycles card since then. It was angel cards that convinced me to learn Reiki. 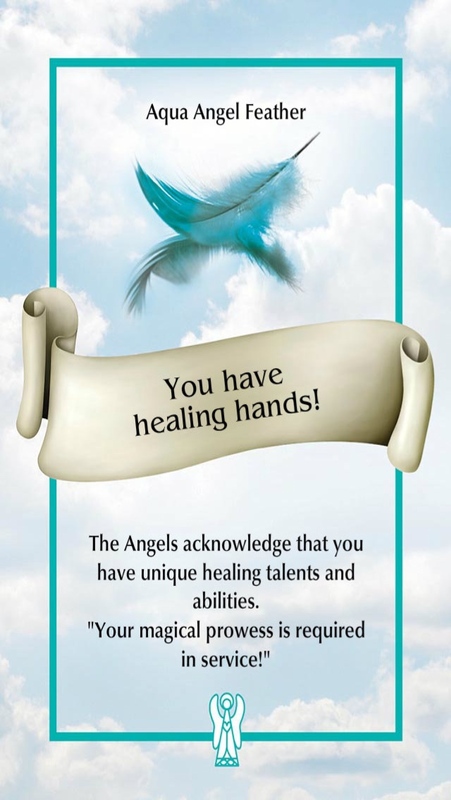 I often picked up ‘You Have Healing Hands!,’ the card from the Angel Feather Oracle, and ‘Energy Healings,’ the card from Ascended Masters. In fact, I was interested in Reiki but did not have the courage to learn it. Reiki is a common healing tool in the Indian culture, and there are many Reiki masters in Mumbai. (People here learn Reiki even to grow their hair faster for their wedding!) I got a tip from my Angels to choose the best master and applied for the class. It turned out that the master my Angles suggested is familiar with gems, oracle cards, and Angels, so I’ve learned not only about Reiki but also the connection between Reiki and Archangels. I remember the second session got extended from 5 hours to 8 hours, and he gave me several oracle card readings as well. Without this experience, I wouldn’t have started my online (distance) angel card reading service, Healing Readings with Nalikolehua. As I started having conversations with my Angels, my life has become much easier; they help me go with the flow. I stopped wasting time indulging in self-hatred but spend more time being optimistic, even in situations I used to be worried about; I am more aware of my true feelings and actively work towards what I want to realize. And now, as soon as I take action, what I expected comes true, from small things to big ones. I started Healing Readings with Nalikolehua because I wanted to deliver the voices of the Angels to people who need their support. Advice from the Angels is practical and useful at any time, and mostly the ideas, plans, and actions they suggest are inevitable for achieving your goal. I live my life as an Indigo Child and would like to provide you with a support, especially for self-realization; being true to yourself and then taking back your own spiritual power. I would help you enjoy your Spiritual Journey! Your Angels are waiting for their invitation into your life. I look forward to hearing from you.